Newly renovated as a bed and breakfast on the magnificent Keweenaw Peninsula, Sand Hills Lighthouse Inn now welcomes you to a memorable experience. 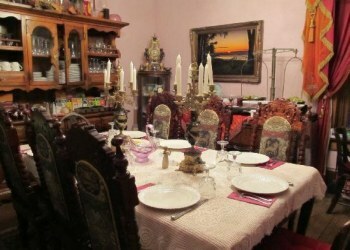 Furnished in Victorian charm, this historic building summons you with an original lens and nautical lighthouse artifacts, as well as many antiques, oil paintings and photographs. 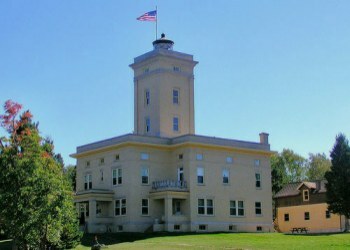 Sand Hills Lighthouse, listed on the National Registry of Historic Places, is the largest and last manned lighthouse built on the great lakes. Built in 1917 to house three lightkeepers and their families, it remained active until 1939. At that time, the Coast Guard took over and automated the station, and 200 men lived there when the grounds were used as a training site during World War II. The property then stood vacant until it was sold in 1958 by government auction. In 1961, Bill Frabotta purchased Sand Hills Lighthouse and the entire station. From the Moment you arrive at Sand Hills Lighthouse Inn, Bill Frabotta welcomes you to the home of his dreams. 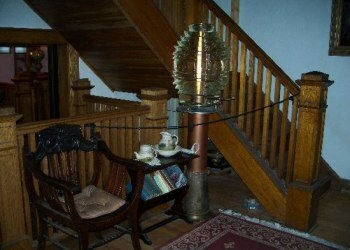 The property's Fog Signal Station served as his summer cottage for more than thirty years. The seemingly impossible task of renovating the lighthouse began in 1992. After years of tremendous effort, in 1995, Sand Hills Lighthouse Inn was ready to welcome its first guests. Capturing a Victorian spirit, the common-room and dining areas will invite you to cozy up by the fireplace with a good book, or linger on the rich leather couches for some old-fashioned conversation or piano music. From its ornate crown mouldings to the hand-tooled walls and staircase balustrade, no detail for beauty and comfort is spared. Air conditioning and hydronic heat are just two of the many updated luxuries. A trip to the top of the lighthouse tower is certain to be a highlight of your stay at Sand Hills. 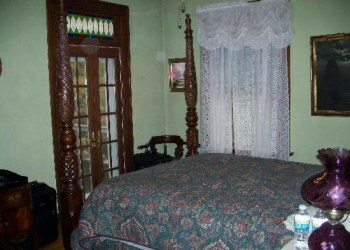 Each of the eight lovely rooms features a king or queen-sized bed and private bathroom. Two rooms have whirlpool bathtubs and a balcony overlooking Lake Superior. The romantic King Room features a canopied king-sized bed, a fireplace, and a fabulous view of Lake Superior. Early morning risers enjoy a spectacular sunrise from the rocky shore, front porch, private balcony, or the tower, while the rich aroma of specially blended coffee and our sumptuous gourmet breakfast lure others who are sleeping in, awaiting the 9:30 serving time. Each of the eight lovely rooms features a king- or queen-sized bed and private bathroom. Two rooms have whirlpool bathtubs and a balcony overlooking Lake Superior. The romantic King Room features a canopied king-sized bed, a fireplace, and a fabulous view of Lake Superior. Sand Hills Lighthouse Inn is open year-round. Reservations can be guaranteed with one night's deposit by cash, personal check, or traveler's checks. Two night minimum stay required May through October and on weekends. Two weeks notice required for full refund. Check-in time is 4:00 PM. Check-out time is Noon. Eagle River Light was the only lighthouse between the Keweenaw Waterway and Eagle Harbor Light. With the end of the copper boom in the 1870�s the Eagle River, Michigan harbor started to decay. "By the 1890�s, it seemed the only ship coming into the harbor was the lighthouse service tender." It was recommended to build a new lighthouse at Sand Hills where most of the lake traffic was traveling and to decommission Eagle River. Many years after the decommissioning of the Eagle River Light, Sand Hills Lighthouse was commissioned in 1917, as a response to a number of instances of ships that had run aground on the nearby "Sawtooth" reef -- which lies just below the surface�in the previous few years. It is about halfway between Eagle Harbor Light and Ontonagon, Michigan. The Lighthouse was completed in May 1919 and was in service for 20 years as a manned aid to navigation. complete with 3 keepers. It is "the twin" of the ill-fated 1940 Scotch Cap Light on Alaska's Unimak Island. In 1945, Anthony Petit was assigned the lighthouse keeper to the Scotch Cap Light heading up a five-man crew. All were killed on April 1, 1946 when a massive tsunami struck the station, destroying it. This was the worst disaster to ever befall a land-based Coast Guard light station. The United States Coast Guard has named a buoy tender USCGC Anthony Petit based in Ketchikan, Alaska in his honor. The site includes an oil house, garage, barracks building (1916, and used in World War II, and a concrete breakwater (1917). The station originally had a Fourth Order bulls eye lens lighted by an oil vapor lamp, which was visible for eleven miles. In 1939, the Coast Guard assumed responsibility for the Lighthouse and automated its use, eliminating the need for keepers. In 1942, it was converted to a wartime Coast Guard training facility, housing and schooling roughly 200 trainees at a time. In 1943 it was closed as a training location and reverted to being simply a lighthouse. It continued as an active lighthouse until 1954, when it was decommissioned, in part due to improvements in weather forecasting and the adoption of radar. It stayed empty and idle through the next few years, finally being liquidated and sold at public auction in 1958 for $26,000 to H. Donald Bliss, an insurance agent from the Detroit area. In 1961, it was sold again to Bill Frabotta, a Detroit photographer and artist who used the fog station as a summer cottage. 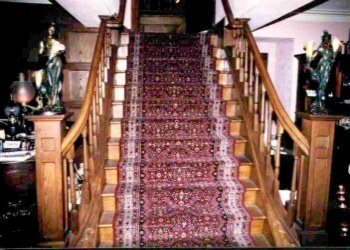 In 1992, Mr. Frabotta began a comprehensive 3 year rebuilding project, and along with his wife, Mary, converted the entire facility into a premier Bed and Breakfast Inn. Mary Frabotta plays the 106 year old parlor grand piano each evening for guests. It was selected by American Historic Inns as one of the ten most romantic inns in America" and rated in the top 15 Bed and Breakfasts with the Best Gourmet Breakfast by The Bed and Breakfast Journal. In 2001 the fog signal building was restored.